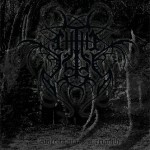 Chthe’ilist’s debut has been expected by underground death metal fans for some time. To them, it seems like a promising project faithful to the ideals of atmospheric technical bands such as Demilich and Timeghoul, from whom it takes unmistakable cues. Less fortunate are the influences of popular (in the underground) but ultimately less effective acts Rippikoulu and Crematory. The first two lend a constructive helping hand while Crematory’s contribution distracts with purely technical and empty nonsense detached from clear evocation, and the unimpressive Rippikoulu lends its spacious approach that suffers from the blunders of Wagnerian operas: sparsely located treasures in a sea of boredom. Worth mentioning are a couple of very Voivodesque moments that are surprisingly integrated in a way that they do not seem out of place. There are several reasons why this release is worth taking a close look at independently of how close we consider it to come to a masterpiece. Existing reviews come awfully short of a real musical insight, opting instead to spend a huge chunk of the time in talking about how cool the guys in the band are, or how ‘awesome’ the vibe is. They are utterly useless when they reach their faux attempts at providing any meaningful observations on the technical side of things. At most, they manage a colorful picture of the mental impressions that the music gives them; this at least is inspiring. Chthe’ilist’s album gives us so much more to discuss not only from its plentiful contents but what they relate to as descendants and composers. In the interest of a well-rounded critique, Le Dernier Crépuscule should be observed from two different vantage points. The first is to place it within its historical context, and keep present whatever musical influences it appears to have. The second is to ignore everything but our intuition (which is dependent on past experience and understanding, in any case), so that we allow it to articulate and speak out for itself as it draws energy from predecessors we take notice only as an afterthought. Le Dernier Crépuscule can be roughly divided into two sections, the first consisting of the first five tracks and the second of the remaining two. The first track itself should probably be excluded as it is little more than an intro. The structuring of the next four follows a certain pattern while the last two each follow a freer approach than the one preceding them. The first is Crematory-dominated, while the last increasingly shows a predominant Timeghoul presence. Throughout the record one finds Demilich’s riff style in about half of the individual riffs. This emulation ranges from almost outright shoplifting from Nespithe to more respectable yet still recognizable inspiration. The rest of the riffs also contain the less distinct (read as ‘more random’) but technically recognizable influence of Crematory and some war metal filler while the more creative and original single sections probably come from general Timeghoul influence, which allows for more open interpretation. Tracks two to five follow a rough plan of riff variations1 lined up one after the other until the solo comes to mark a climax, after which there is a reiteration of previous material and the song ends. 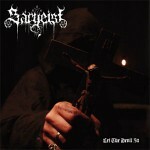 It is the “easy way out” of death metal structures, albeit expanded by a greater quantity of riffs. Le Dernier Crépuscule takes the most relaxed route when it comes to conceptualization as well, choosing to go for Crematory’s2 brand of strands of riff variations connected in riff salad manner. Now, Crematory’s style is marked by another particular aspect, and that is that it places technical flare and variety at the top of its priority list. Its choice of allowing runs of related riffs is more the following of what was in vogue at the time, since one can observe that songwise, there is very little keeping it all together but the general tag of the genre. Something similar happens to these first songs by Chthe’ilist. The sixth and seventh tracks are clearly steeped in a more progressive mindset, allowing for creativity to bubble up as the band tries to craft a narrative. This is conducted with far more success on the last track, ‘Tales of the Majora Mythos Part 1″, than on the hybrid ‘Vecoiitn’aphnaat’smaala’. This emphasis on following a far-reaching narrative reaches formidable proportions in this last track where I would venture to call it a storyline. Variety in riff type is actually richer here than anywhere else in the album, yet through this story-telling technique (that is very much reminiscent of the dramatic flair of Timeghoul on Panaramic Twilight) Chthe’ilist achieves something beyond mere coherence — a smooth flow of ideas connected through careful considerations in texture and rhythmic contrast between sections. These considerations must reach further than adjacent riffs or mere riff-strands so that the song itself does not fall apart. Unfortunately, although this last track shows us the brightest future for Chthe’ilist, Monsieur Tougas has yet to learn how to finish a song, and what could be an incredible opus is watered down by an unsure appendage after the coda following the solo, a four-minute long welling up of unnecessary nothingness. Content-wise, this adds nothing to the song except confusion, since it is mostly noise and blast beats, which we may presume is an ill-achieved attempt at creating ambience3. The rest of the song itself might be as clear-minded as Timeghoul’s best work, but it is still a work in progress. 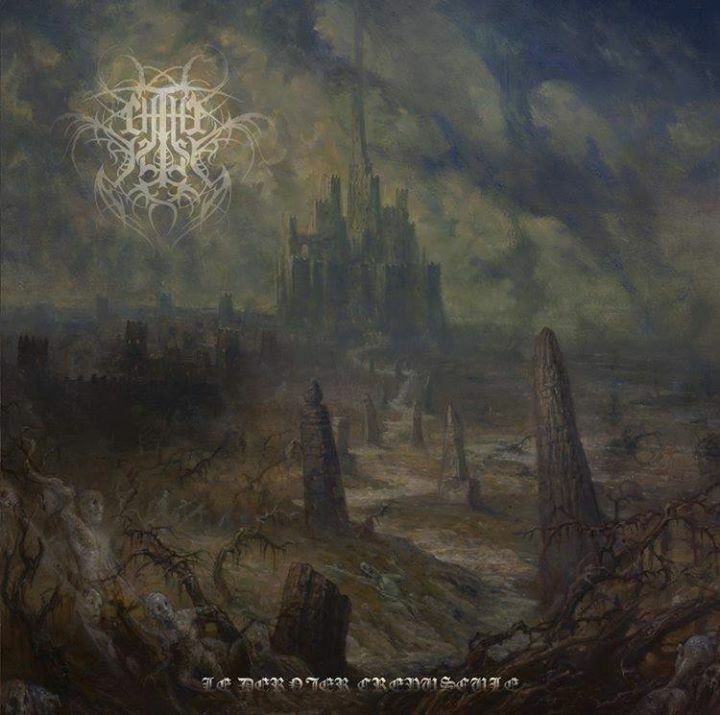 Le Dernier Crépuscule is constantly touted as “Lovecraftian death metal”, and while I get the reference, it seems to me that the character of the music is much more cartoonish than even the original stories, which is saying a lot considering that Lovecraft’s work is already minimalist pulp horror. Taking only a chunk from this author’s work and making a concept album out of it becomes a bit redundant after 2 or 3 songs, and in this album I mostly hear At the Mountains of Madness with some more general references to the Cthulhu mythos towards the end. This limitation results in a bloated album with more words than actual things to say. In fact, I’d say that for a Lovecraftian experience this is too limited. Timeghoul’s sound, for instance, is very appropriate for expanding on the whole range of cloudy feelings and visages that Lovecraft exposes, not only the mouth-tentacles of his famous monster-deity. Proof of this is that while a Demilich sound on a Crematory template can at most show entrails and guts and an in-your-face horror, the last track had me catching glimpses of R’lyeh through the oceanmist. In Lovecraft you find not only the gnarly gore of slimy and ghoulish creatures, but visitations to otherworldly views in a variety of dream states, alienation from reality expressed through either an increasingly horrifying vision of the world or just not knowing at which side of the sleep curtain it lies. Lovecraft condenses the very essence of the death metal spirit in its several manifestations and a project with the gigantic potential of Chthe’ilist is surprisingly limited in its choice of evocation, while playing around withtoo many riffs than needed in what appears to be that Crematory-like bloating of content for its own sake with little reference to anything beyond it. Chthe’ilist has a potential of ‘epic proportions’, as the common saying goes. It could have us contemplating at Algol, wondering… it could take us on a bizarre journey through perilous Kadath, and it could make us doubt the very truthfulness of our material existence. In short, it could be the long-awaited metal Messiah that crystallizes the whole of Lovecraftian experience from the essence of the most meaningful obscure acts of the past. But it isn’t. Bringing together the last two discussions allows us to properly discuss the results Chthe’ilist has achieved. Most bands seem to create a division between music making and lyrical topics, which is not necessarily a bad decision if everything is flowing from a same wellspring of inspiration. The pitfall of this approach is that the sources could end up being distinct, even if compatible, so that the impact of either is dulled by even the slightest hint of cognitive dissonance. This dissonance may even occur in music that is supposedly unified with its lyrical content, and in the case of technically-oriented bands like Chthe’ilist it usually comes about in the form of what could be called ‘riff distraction’. Riff distraction is a phenomenon that consists of the metal artist losing sight of perspective as he lies on the floor, dull-sensed on proverbial soma. This sends riff-writers off in a mythical quest for the perfect riff combination until they end up with a mass of exciting but ultimately meaningless mumbo jumbo. This is the plague that afflicts this release; its most obvious priority seems to be riff-making, and the clearest sign of a climax is the guitar solo. This album’s is very intentional and varied, but with no precise evocative purpose in mind, so that this huge ball of varied rhythms ends up being a uniform mass when seen from afar. The guitar solo, then, becomes the only way of bringing the song to a breaking point so that at least something in the landscape stands out as a signaling agent for the ending to come with at least a semblance of an excuse. Alas, the limitation that is holding back Chthe’ilist lies in the mindset of Master Tougas: his towering talent and creative juices ooze with latent power, but his imagination appears to be held back by rationalist prejudices of modern thought that reduce a powerful mythos to mere cartoon. This results in tongue-in-cheek funny horror, which may be an overplaying of the purposely awkward feeling of Demilich that is often perceived simply as funny yet interesting. Timeghoul’s immense aural depth could be the answer here, as the flexibility of its approach lies in the dramatic expansion of predefined techniques within a limited (yet more varied, at the same time) vocabulary that makes even its most complex statements convincing and manifestly intelligible4. As pretentious as the thousands of words I’ve already written might make me sound, I would still like to encourage Monsieur Tougas to continue this general line of thinking, while paying closer attention to composition and evocation aspects that lead to a stronger narrative in longer songs. 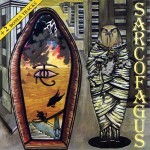 These seem to possess, at least in their present state, the greatest potential of his technical and atmospheric style. His work can bring to reality not only what Timeghoul could have become, but something beyond it, with a long-awaited deftly and graciously applied riffcraft inspired by Demilich. Ditch the Crematory when it comes to structuring decisions, and refactor out any content that isn’t completely indispensable5. Personally, when it comes to heavily-charged albums such as Le Dernier Crépuscule, I hold a 10-time listening policy: testing how well and in what manner a music album holds up after listening to it completely the first ten times in less than a few days. This has several interesting effects, the first of which is that initial shock effects fade away, technical flare appears more fixed to context, everything gains perspective. Sadly, this album only made it to six listens before losing its luster, and this is mainly because the overall structure of songs and the character they evoke fall into place as an integral whole, revealing the utter simplicity lying behind the tons of riffs and tasty guitar licks. The reason why the most convincing underground metal has almost always come from the minds that are most “out there” is because their music flows from deeply-ingrained convictions, veritable nightmares that are as real as the sun’s burning sensation, or the excruciating pain of sincere longing for a different reality. While your metal remains “meta”, while it remains only a “fun” way of exploring “spooky” images that are “not real”, your metal will also remain a laughable cartoon. In earlier ages, as instinctive concepts welled up in the mind of man, his conscious mind could no doubt integrate them into a coherent psychic pattern. But the “civilized” man is no longer able to do this. His “advanced” consciousness has deprived itself of the means by which the auxiliary contributions of the instincts and the unconscious can be assimilated. These organs of assimilation and integration were numinous symbols, held holy by common consent. In earlier times, these principles were worshiped in all sorts of rituals, which at least showed the psychic significance they held for man. But now they have become mere abstract concepts. 1 By riff variation, I mean a grouping of related riffs that arise as variations from a seminal idea. 2 When taking Crematory’s Denial as a point of reference, we can observe how Crematory cannot hold a mood and a line of thought for too long. The music is based on providing variation; for instance, it introduces contrasting ideas in rhythm in extreme fashion so that even very Latin African rhythms pop up right besides more grindy ones with no particular purpose. It may be more difficult to notice, but Demilich already contains such range of variation, but it is much better organized, so that it does not feel haphazard. Furthermore, Demilich is able to stamp their own seal on each section by delimiting certain combinations of rhythm and mode, while Crematory pretty much just throws whatever it can find in your face as it desperately clutches for more content to display a different drum technique. It’s not that Crematory plays no positive role in the music of Chthe’ilist, but it should be used within its effective scope: the riff variation; and taking note from those who excel at long-range composition when organizing structure. 3 This is a distractor that infects the mentality of modern death metal musicians; it’s almost as if they feel that the music is not enough, that they need to add more “stuff”, whatever it is. This fools the less-focused sort of listeners (apparently, the majority), but not those who would listen to music from multiple angles so as to extract all it contains and more. 4 That is to say, although the difference between the opposite styles within Timeghoul’s vocabulary (from pounding, crowded gnarly riffs to clean-vocal lamentations) may be wider than Crematory’s, the consistency with which they are used imbues them with a more meaningful sense of purpose. 5 A lesson might be learned from Ludwig van Beethoven’s own methods. He is probably the most respectable of classical composers with an inclination for “wild progressive” ideas, since he did not slip into avant-garde stupidity. Beethoven’s music was shocking in its own time for its juxtaposition of apparently contrasting ideas, but he would not leave them there. They were justified, as it were, through their careful development and envelopment throughout the rest of the piece or even in later movements, creating an unprecedented technique in bringing together content in long-range fashion through a process of entanglement. 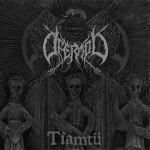 You don’t get a great deal of straight up Demilich worship, but Chthe’ilist got some buzz a few years ago for having some clear similarities in their aesthetics and writing style. This presumably continues on the band’s upcoming full length debut – Le Dernier Crépuscule will come out in January 2016. Several record labels have claimed the rights to various formats, but Profound Lore is responsible for the CD pressing and digital releases, so that’s probably who you should go unless you’re a major collector. 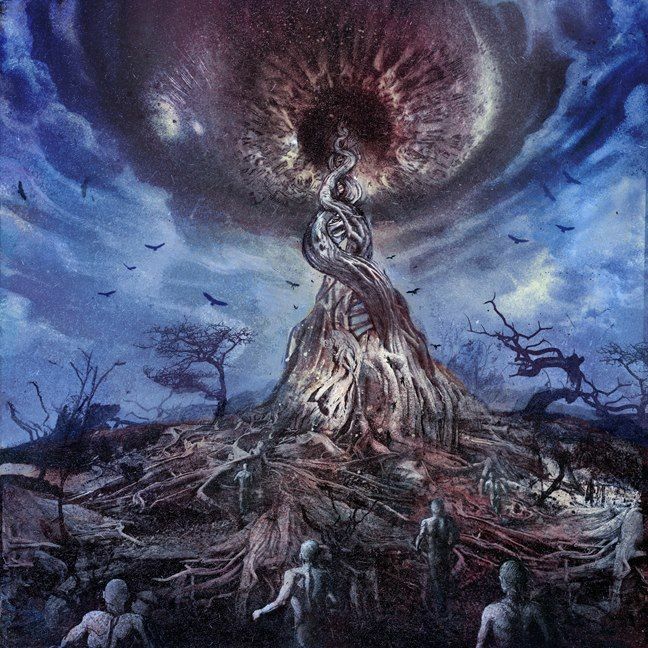 Profound Lore has already released a preview track from this album – “Voidspawn” bears some surface similarities to the works of Demilich, but otherwise sounds a bit smoothed out and obviously streamlined to meet the requirements of a larger audience.